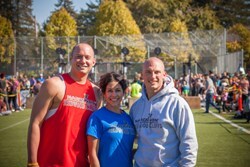 Redwood Cliffs rehab staff compete in local Crossfit competition. Redwood Cliffs rehab staff at Crossfit competition. Many Redwood Cliffs drug rehab staff have started participating in Crossfit, so they competed at the recent Crossfit Affiliate Cup in Santa Cruz. Narconon Redwood Cliffs is dedicated to getting addicts clean and sober through the most effective means available. On a daily basis, this means helping addicts detox from harmful drugs and work their way through life skills courses that can help them return to being a contributing member of society. Occasionally, however, another opportunity will present itself for both students and staff to take recovery to the next level. On these occasions, Redwood Cliffs staff leap at the chance to field even more ways to help addicts walk the road to recovery. This recently took the form of Redwood Cliffs staff members participating in the 5th annual Crossfit Affiliate Cup in Santa Cruz, CA. This was a great way to show the center’s dedication to fitness in general, but it is setting a great example for all those that want to live a healthy, drug-free life. Crossfit Inc. is a corporation founded by Greg Glassman in 2000. Glassman started his first gym in Seattle, Washington, and the brand quickly expanded over the next few years. Today, there are about 7,000 Crossfit gyms around the world. The workouts are a mix of classic weight training, gymnastics movements, running, cardio work and several other specialized routines. Every session runs about an hour, and the workouts are high-intensity. There is no standing around and chatting as one person does bench presses. You move quickly between routines in order to keep your blood pumping and your body making progress. Crossfit exercises usually see quick changes to their fitness level and general health over the course of a month or two, and many opt to stick with the program long-term because of the huge benefits they see compared to other programs. Another facet of Crossfit not seen in many other workout programs is the competitive aspect. Members of individual gyms engage in friendly competition by posting their scores of how they did each day. For example, they can compare scores of how fast they finished a timed workout or how much weight they were able to lift in a non-timed, weight-centric workout. In addition to this friendly competition, Crossfitters can compete against the members of other gyms leading up to regional competitions. These operate like sporting events where competitors will engage in workouts that they only find out about hours before they are performed. Winners of these regional events can go on to compete at National competitions, as well. The winners are minor celebrities in the Crossfit world and applauded for their commitment to physical fitness. Many Redwood Cliffs drug rehab staff have started participating in Crossfit, so they competed at the recent Crossfit Affiliate Cup in Santa Cruz. It was a fun-filled day with lots of food, music, and cheers for the incredible performances of all involved. They did a great job representing Narconon Redwood Cliffs, and they are showing just how dedicated the center is to helping addicts recover. Being healthy is a major part of this recovery, and daily exercise that leads to an overall healthy lifestyle. Good job, guys, you made us proud. Narconon Redwood Cliffs offers long-term, residential drug rehabilitation and drug prevention services. It is located in Watsonville, California. For more information on Narconon, call 1-800-775-8750.